Due to technological advances and affordable prices, DNA testing is now becoming widely used to confirm family lines and connect with biological relatives. You may want to discover branches of your tree not found through regular research, confirm or disprove family relationships, find cousins with whom to share research & photos, see if persons who share your surname are related, discover your ancient origins, potentially solve long-standing research ‘dead-ends’, explore the validity of family stories, identify previously unknown close family (eg. adoptees searching for parents), or you may simply be curious to see what your DNA reveals. Don’t let the scientific nature of DNA scare you off, as once the basic test types are understood, the minimum technical know-how required is the use of email and messaging in order to contact your DNA matches. Collaborate with your new-found genetic relatives using your traditional genealogical skills to determine your ancestors-in-common. For those who want to delve deeper, there are many free tools and learning resources. A DNA kit is ordered online from one of the major DNA testing companies. Your test kit arrives by mail or courier within a few days to a few weeks, depending on company. After testing, you simply post your sample back in the pre-addressed envelope or package. All notifications are via email and results are provided via an online account. Once your DNA has been tested, your results are added to a very large database and you access them via your online account (nothing is sent by mail). Even if you have no close matches initially, large numbers of people are testing each week (including from Australia, NZ, UK & Ireland), and you will continue to receive new people matches regularly. Your online account is also used to keep track of your order status, to enter your family tree and ancestral surname information, to join projects, to see your results and which people you match, to manage your profile and tree settings, and to download a copy of your DNA raw data file (for use with additional tools/sites). Y-chromosome DNA (Y-DNA): Males inherit a y-chromosome from their father, through his father, his father, his father, etc, on the direct paternal line, as per the blue boxes on the chart above. Refer to Y-DNA: the Direct Paternal Line for more detailed information, pedigree charts and examples of how Y-DNA testing can be useful in your family history research. Mitochondrial DNA (mtDNA): Everyone inherits mitochondrial DNA from their mother, through her mother, her mother, her mother, etc. on the direct maternal line, as per the pink boxes on the chart above. Refer to mtDNA: the Direct Maternal Line for more detailed information, pedigree charts and examples of how mtDNA testing can be useful in your family history research. Autosomal DNA (atDNA): Autosomal DNA is inherited from all ancestral lines, so anyone can be tested and your matches may descend from anyone on your pedigree chart, up to about 6 generations back (but may be further). Refer to atDNA: Finding Matches on All Ancestral Lines for more detailed information, pedigree charts and examples of how atDNA testing can be useful in your family history research. X-chromosome DNA (X-DNA): X-chromosomes follow specific inheritance patterns, which are different for males and females. If you share X-DNA with a match, your shared ancestors will be restricted to particular lines of your pedigree. Refer to X-DNA's helpful inheritance patterns for more detailed information & pedigree charts related to X-DNA inheritance. For more details refer to What type of DNA tests are available? Autosomal DNA tests include an estimate of your ethnic ancestry, including cluster maps and population migration maps showing where your ancestors came from hundreds or up to a few thousand years ago (sample at right: Family Tree DNA's myOrigins). In FTDNA, the map may also display pins showing the locations of your matches' most distant known ancestors. For those who are interested, other tools allow your DNA kit to be compared with ancient DNA, such as Neanderthal. 23andMe in the US was initially a health reporting company that expanded into genealogy matching. No health reporting is available in Australia or New Zealand. Limited health reporting is available to residents of the US, UK, Ireland and Canada. Autosomal DNA raw data from Family Tree DNA, 23andMe, AncestryDNA, MyHeritage DNA and/or Living DNA may be uploaded to www.promethease.com to generate health reports, for a cost of US$5. Refer to the information and videos on the Promethease home page. There are five major DNA testing companies for genealogy - Family Tree DNA, 23andMe, AncestryDNA, MyHeritageDNA and Living DNA. Family Tree DNA is popular for testers from Australia & NZ, as it has a large international database, sells all test types, is very affordable, requires no ongoing subscription, hosts thousands of surname and geographical projects, and provides easy analysis tools. 23andMe has a large database, although testers are generally more health-focused rather than interested in genealogy. It has some great analysis tools and highly-regarded ethnicity results, but its compulsory international shipping makes it very expensive for Australians and New Zealanders. AncestryDNA was previously US-only, but launched in Australia & NZ, UK, Ireland and Canada during 2015 and has now surpassed 14 million testers worldwide. Ancestry's huge collection of member trees can be linked to DNA results to help identify relatives through Shared Ancestor Hints. Its DNA matching features work best with a subscription and a public family tree. MyHeritageDNA is newer to DNA testing, but it has over 100 million members, so is growing very quickly and providing some great matches! Living DNA breaks down your ancestry into 80 worldwide regions, including 21 British regions. Irish, German and Scottish regions will be added soon (existing results will be updated). Living DNA's matching database is in Beta at the moment, ready to launch in the coming months. For a review of features and pricing of the three DNA testing companies, refer to Which DNA testing company should I use? Family Tree DNA hosts over 9500 projects, including for surnames, geographical regions, and haplogroups. Australian Settlers DNA, Australian Convicts DNA, New Zealand DNA, British Isles DNA by County, Ireland Y-DNA and Ireland mtDNA are just a few projects that may be of interest. Currently, the favourite test type amongst genealogists who don’t have a specific need to test the direct male or female lines is an autosomal DNA test. AncestryDNA, Family Finder and MyHeritage DNA are very popular in Australia & New Zealand, but review both your goals and the pricing and features of all three genealogy testing companies before you buy, to ensure your choice suits your needs. Expect to be matched with a range of biological relatives, up to 5th cousins back or further. Once your results are released, you can start corresponding with your matches and comparing trees and research to determine your shared ancestors. As more people test, everyone’s chance of finding closer matches improves. It is also very useful to test siblings and other cousins, as they may share DNA with cousins that you don't. For beginners, there are plenty of free links and resources. As you gain experience, there are third-party sites & tools you can utilise to analyse your results and find additional matches. Resources on DNA are plentiful, and if you live in Cairns or are planning a holiday in tropical Far North Queensland, our DNA Interest Group meetings and Drop-In DNA Clinics are a lively place to learn and be guided in your DNA research. Newcomers, visitors and tropical holidaymakers are always welcome! For Facebook users, there is a huge range of great support groups, including: Using DNA for Genealogy - Australia & NZ, DNA for Genealogy - UK, DNA Detectives Down Under (for adoptees or people with unknown parentage), DNA for the Donor Conceived, and Genetic Genealogy Tips & Techniques. The International Society of Genetic Genealogy (ISOGG)'s Wiki provides information and links to resources on everything related to genetic genealogy. 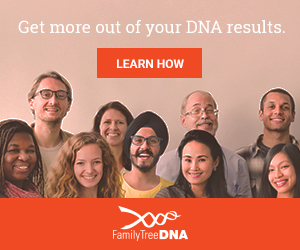 Exploit your DNA to make exciting new discoveries in your family tree!